OK guys, just to look at 1da's thread in a slightly different way, can you find a suitable photograph to caption this little story ? Once upon a time, not so very long ago when I was young (mind you, this is a story for younger people, ie boys or girls, so stay very calm), there lived in this city a fabulous creature. No one was really sure of exactly what it was. There were those that said it was a dog; some sort of olde-worlde dog the likes of which Bill Sykes would have taken down to The Old Victorian (a famed public house) for his evening out had he lived in this city. Others said that it had arrived on a ship many years ago when this city was a great seaport filled with merchant vessels from around the globe and the city buzzed with a kind of exotic elegance now long forgotten. Others didn’t really care at all or at least didn’t appear to do so. Ambrose, for that was the name by which the creature was popularly known, had lived with a family in the next street for longer than anyone could remember. So long in fact that his character and exploits had passed down in a form of folklore again long since forgotten. It was said that they had adopted him as a pup but curiously no one could remember him in anything less than his awesome fully grown form. btw, what exactly lead you to that understanding? All this talk about pie makes me want for pie. I now have this intense yearning for warm apple pie and vanilla ice cream. 1da wrote: hahahaha - Messy, i see you understand well the consequences of not having something that Ambrose wants when he wants it. ...Good thinking on making that pie before showing Ambrose the drawing........btw, what exactly led you to that understanding? just as i suspected Makinamess, you are thoroughly acquainted with the famous, infamous Ambrose. i have to say that digital drawing does not do justice on several accounts to the full glory of Ambrose... there is a resemblance however and the moment is quite typical i suspect. 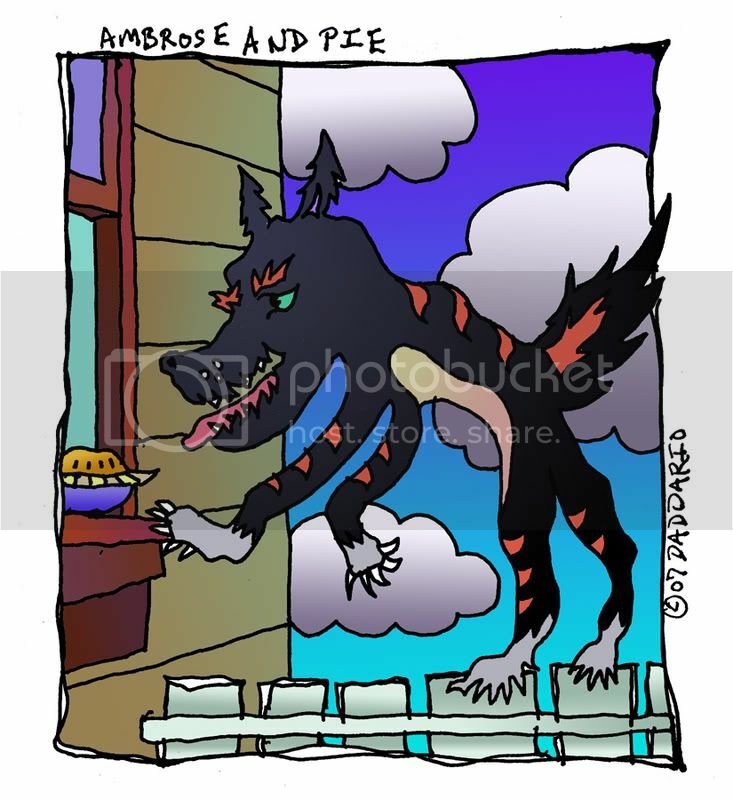 that awe-full temper reputed and most likely verified to belong to Ambrose is probably a result of the Indigestion Reaper Pie that Ambrose often courts through such exploitation.